Chunky jewellery with Bigger Beads! 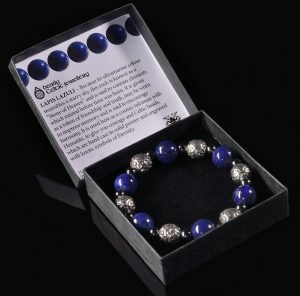 Choose from carnelian, green aventurine, howlite, black onyx, amethyst, snowflake obsidian, garnet, rose quartz, sodalite, connemara marble, red jasper (new), tiger eye, unakite (new), or lapis lazuli…earrings, bracelets and necklaces, all presented in informative boxes. Classic and colourful. Big is beautiful. Classic and chunky, this stretchy bracelet will fit most wrists and is available threaded with our most popular gemstones and pewter Celtic beads, spaced with hematite for courage. Stylish, weighty and colourful. Presented in an informative box. 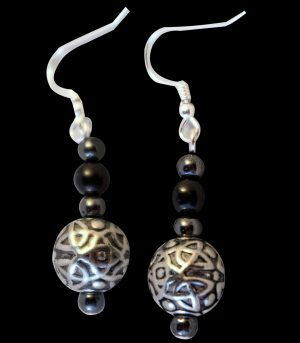 These earrings have been designed to complement the Big Beady necklaces and bracelets. They dangle on sterling silver earwires and are presented in an informative box. Classic and chunky, this necklace measures approximately 17″ and is fastened with one of our Celtic hook&eyes. 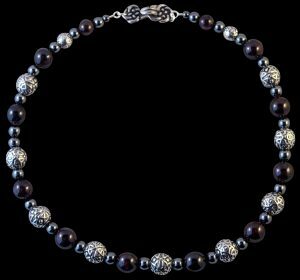 It is available threaded with our most popular gemstones and pewter Celtic beads, spaced with hematite for courage. Stylish, weighty and colourful. Presented in an informative box.